I’m in the thick of Thanksgiving preparations. It’s a team effort with my husband handling the turkey, my mother-in-law making desserts, and me making cheddar dill puffs. It’s a warm up to the full on cooking that will happen tomorrow. So, today’s post will be short. If you’re looking for a special drink to complement your Thanksgiving celebrations, here’s a great one to try. Pear and rosemary are a perfect pairing for fall. Pears are in season now and their crisp flavor adds a little sweetness without being cloying. I kept it easy and used pear vodka and bottled pear nectar rather than making my own. However, I did make rosemary infused simple syrup which is an absolute must for this recipe. 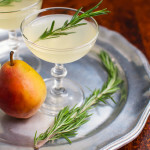 The rosemary adds a subtle spiciness to the pear making this drink great whether you’re ready to kick off your party or put up your feet and relax. Enjoy! Heat sugar and water in a small saucepan over medium-high heat, stirring until sugar has dissolved. Add rosemary; remove from heat. Let stand 30 minutes. Discard rosemary. Let cool completely. Fill a cocktail shaker with ice. Add pear vodka, pear nectar, and 2 tablespoons rosemary syrup. Shake for 15 seconds. Strain into a cocktail glass and top with sparkling water. Garnish with rosemary sprig.